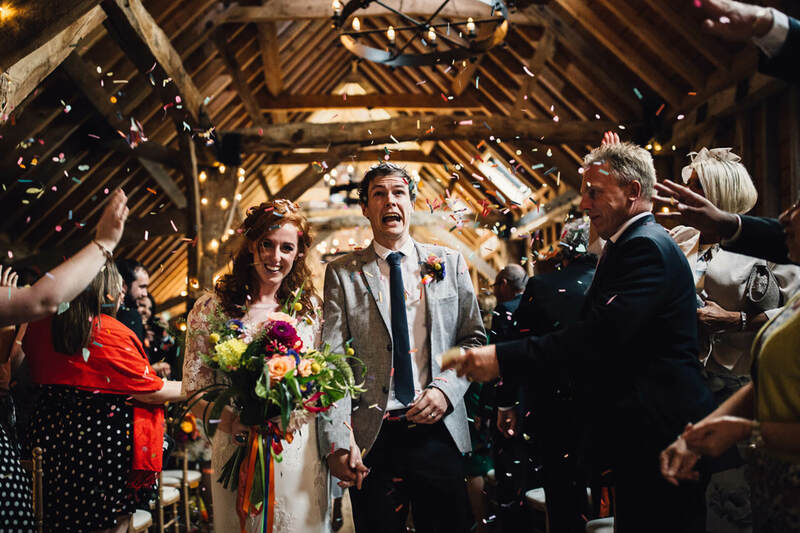 This vibrant September wedding saw a fun, informal atmosphere at Bassmead Manor Barns. It’s party time! 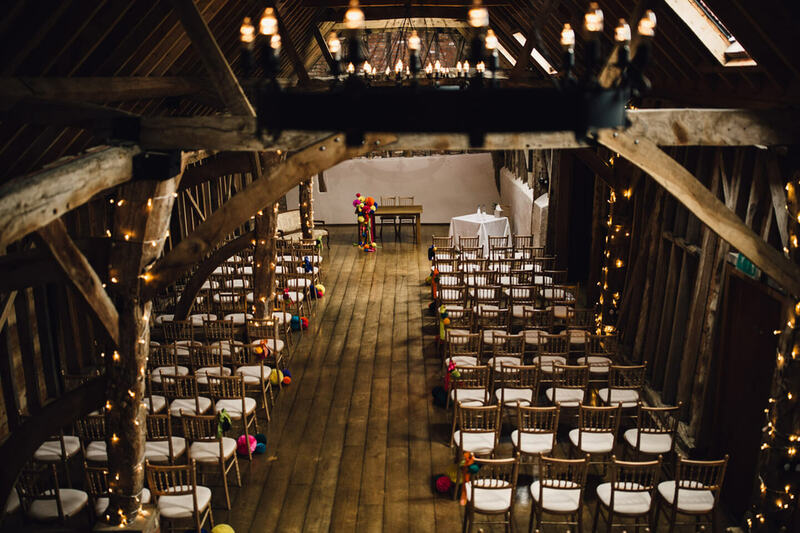 Katie and Chris were on the lookout for a venue where everything could take place under one roof. 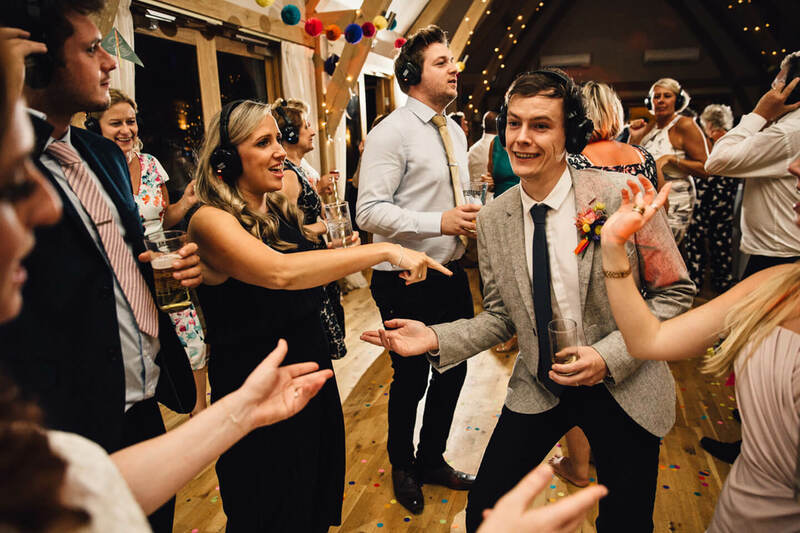 ‘Bassmead had everything we wanted,’ explains Katie. ‘It’s in a beautiful setting, close to home. 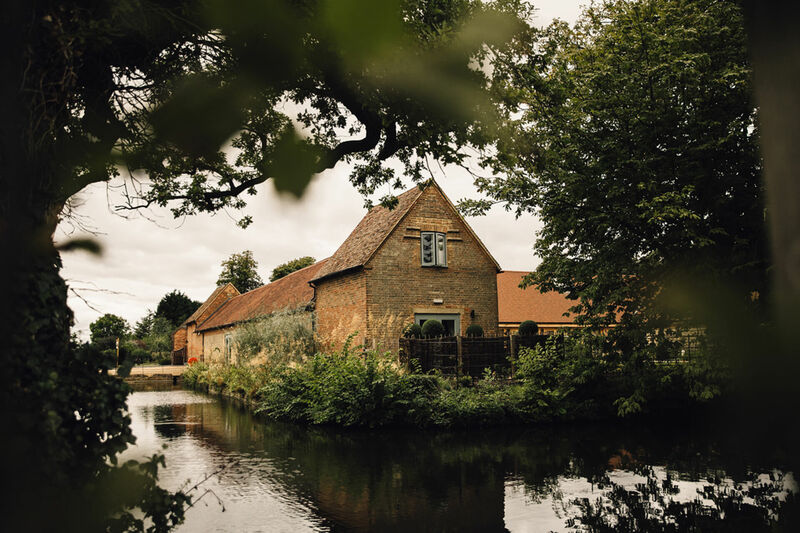 We could have our ceremony and reception at the same location and there was accommodation for us and our family.’ The happy couple also loved the rustic feel of the venue and the fact that it was enough of a blank canvas for them to be able to impart their own style to the day. Glastonbury Festival provided the theme for the day. ‘We’ve had some great times there and decided to use it as our inspiration,’ says Katie. 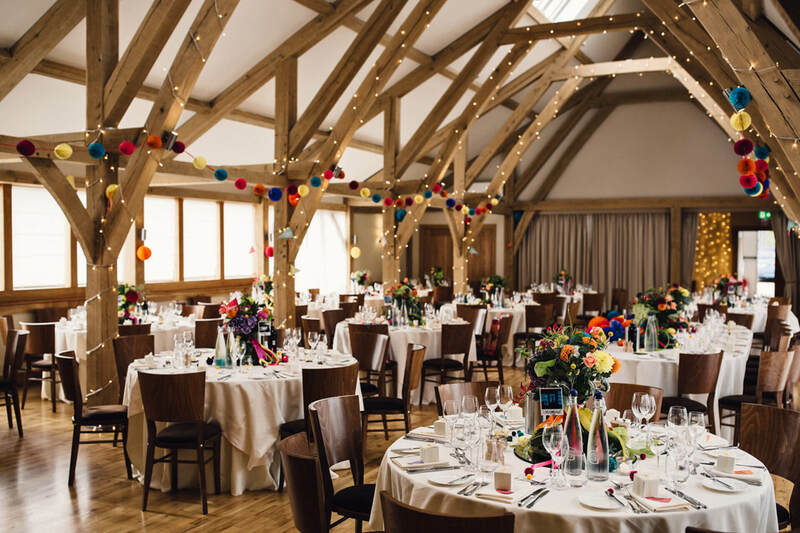 Friends and family made woollen pompoms which were scattered on the tables and the talented florist used paper pompoms and paper fans in various colours and sizes to decorate the Rickety Barn, the table plan and the top table. Alongside bunting, flags and ribbons and vibrant colours including pink, yellow, purple, green and orange, it was a fabulous end result. 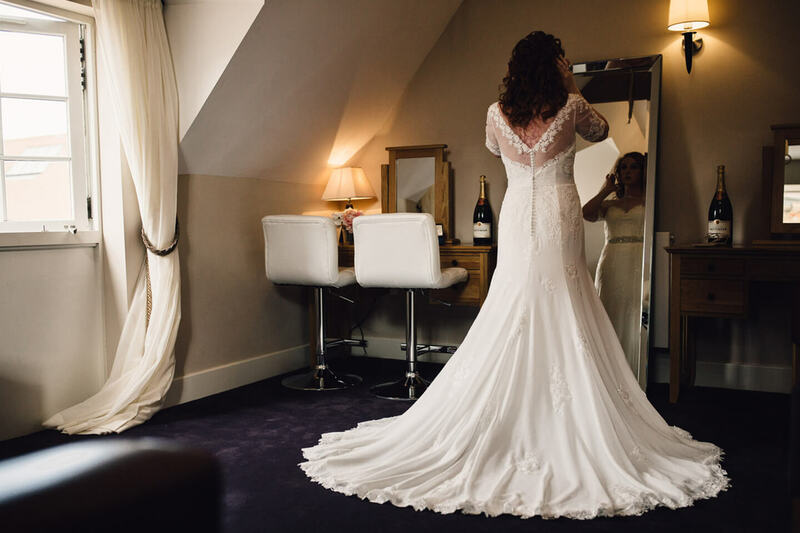 The beautiful bride wore an ivory chiffon and lace Justin Alexander dress from George James Bridal in Bedford. ‘It was the first dress I tried on and I loved it straight away,’ she smiles. ‘I added a belt for some sparkle and it was everything I wanted’. Sparkly sandals from New Look completed the look, with the added benefit of being comfortable! In her hair, Katie wore three beautiful grips, each with a peridot stone to match her engagement ring. 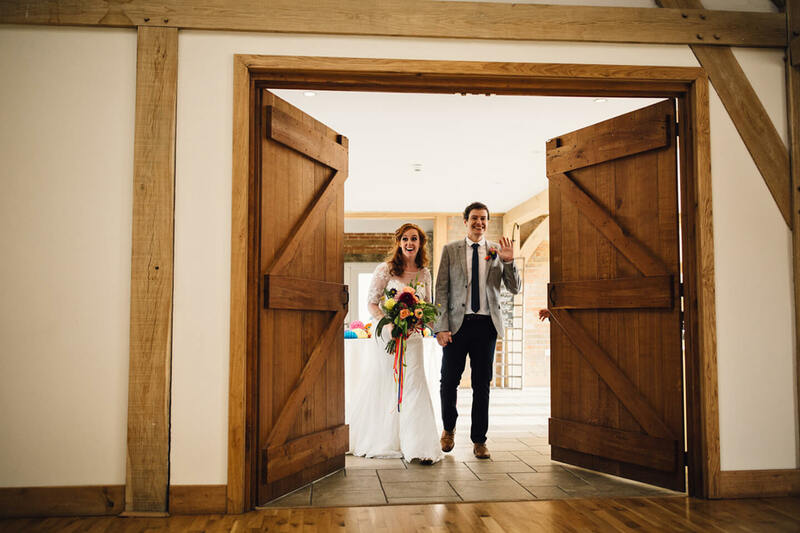 Chris and his best man wore outfits from Topman – a smart yet casual look with grey jacket, navy chinos, a white shirt and blue tie. 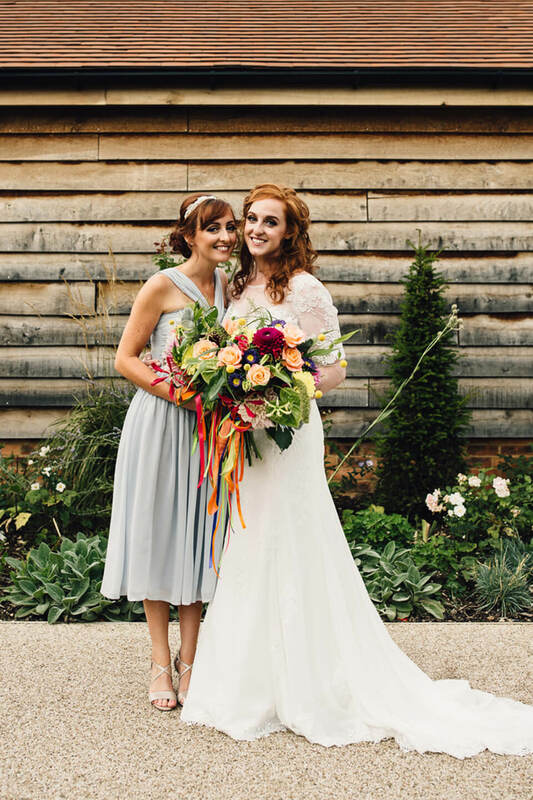 Katie’s bridesmaid, her twin sister, wore a pale blue mid-length chiffon dress with a pearl hairband to complete the look. One usher wore a similar outfit to the groom while the two other ushers were girls and wore co-ordinating dresses. 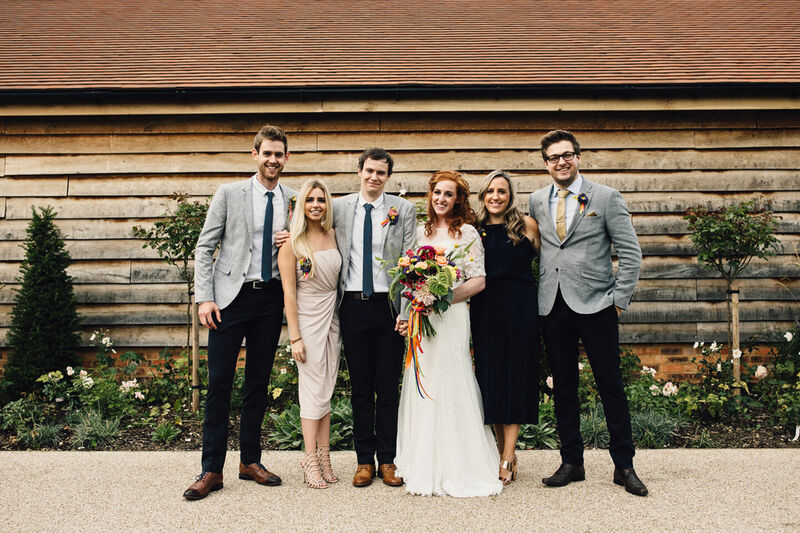 Katie carried a bouquet of Miss Piggy roses, dahlias, gloriosa lilies, craspedia, purple asters, lambs ear and foxtail, tied together with different coloured ribbons in keeping with the ‘boho’ theme. 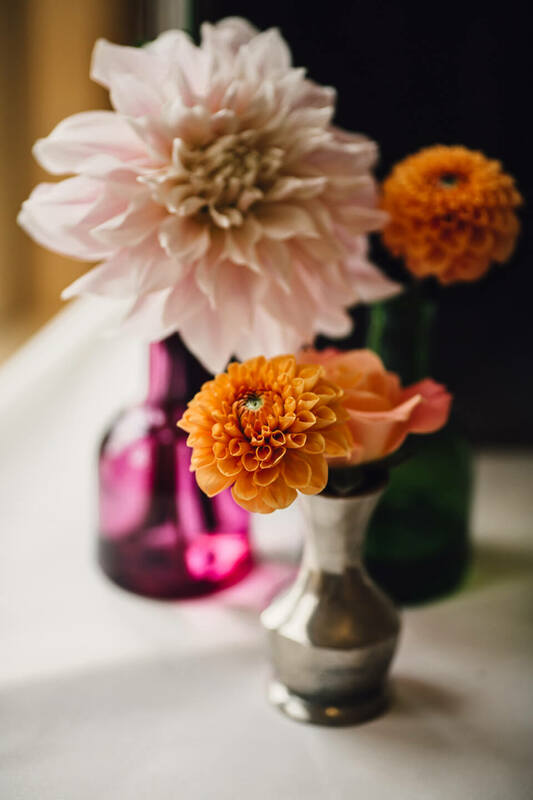 ‘I loved my bouquet so much, I cried when I first saw it!’ she says. Her bridesmaid carried a smaller version of the bouquet, and buttonholes and corsages were made for the bridal party. Chris’s buttonhole incorporated a succulent which he loved. 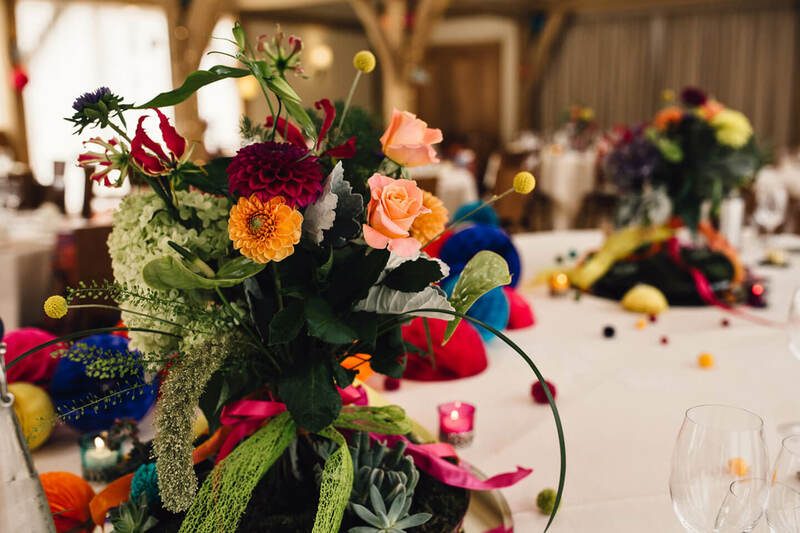 Floral centrepieces continued the theme of the bridal flowers – arrangements of different blooms surrounded by moss and succulents and tied with coloured ribbons. At the end of the day they were all given to friends and family. Sangria Flora, Pimms and a ginger and lemongrass cooler were served in the bar area while guests also mingled in the garden. 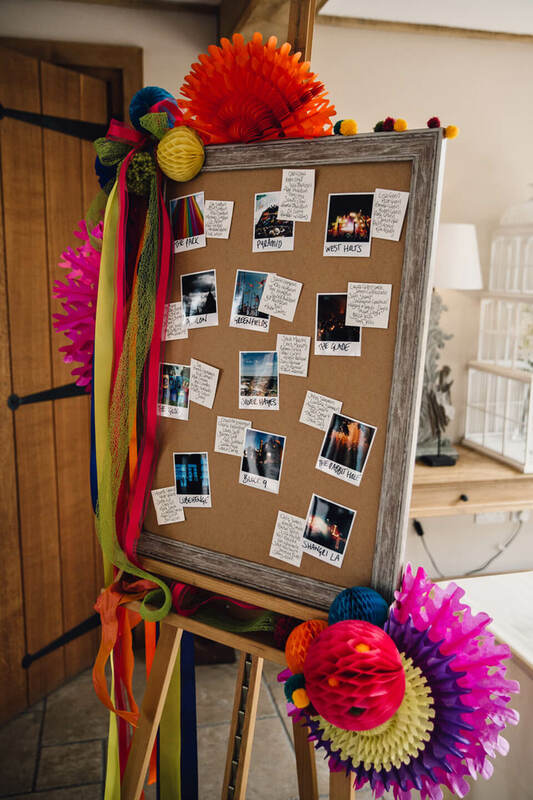 Moving through to the Bridge Barn, each table was given a different stage or area name from the Glastonbury Festival and the table plan was adorned with ribbons and pompoms. On the menu… guests enjoyed a delicious scotch egg to start followed by chicken in a madeira sauce with dauphinoise potatoes. 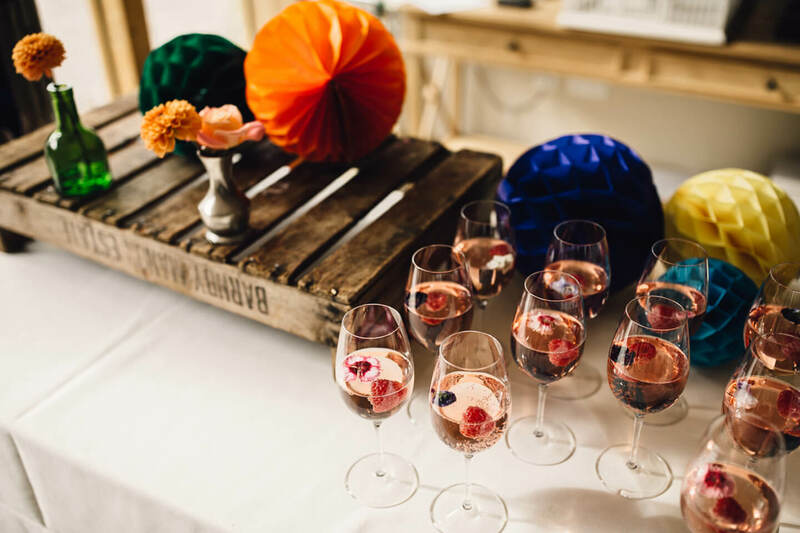 ‘Pudding was a trio of desserts because we couldn’t choose just one!’ laughs Katie. 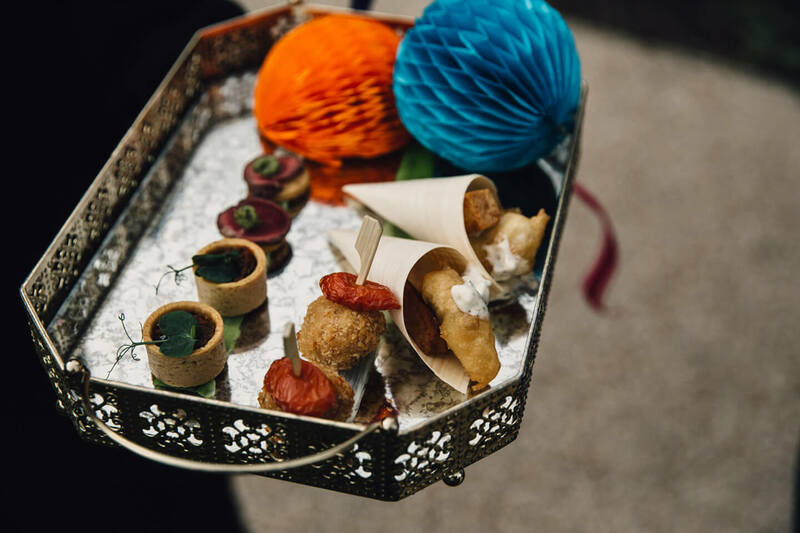 ‘The food was amazing, like dining in a top restaurant’. 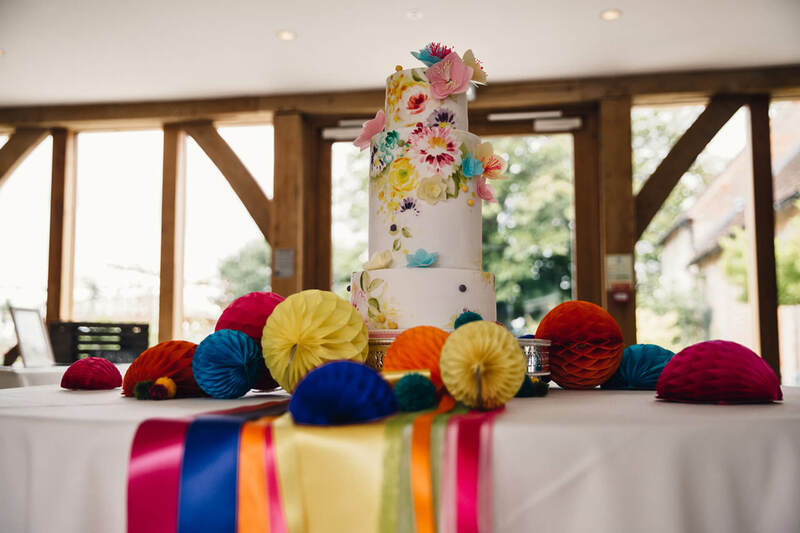 A four tier, hand painted cake with handmade paper flowers was utterly beautiful. 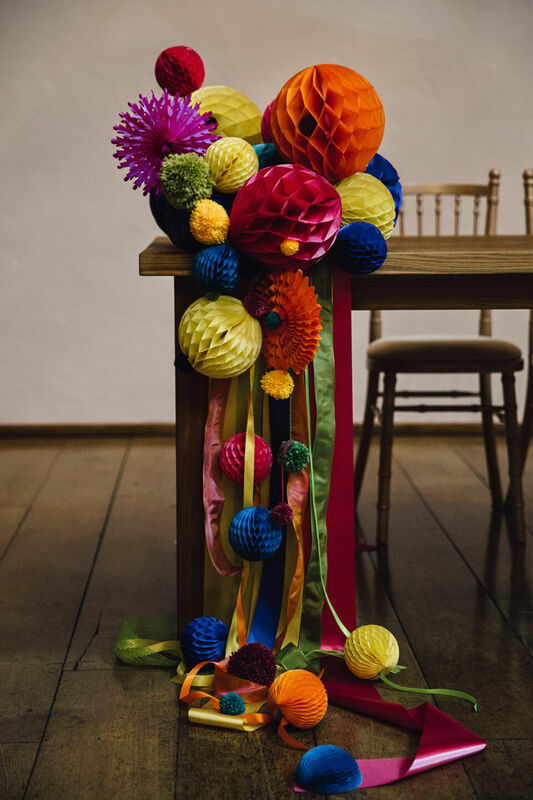 Made by Nevie Pie, the colours matched Katie’s bouquet and it was truly a work of art. 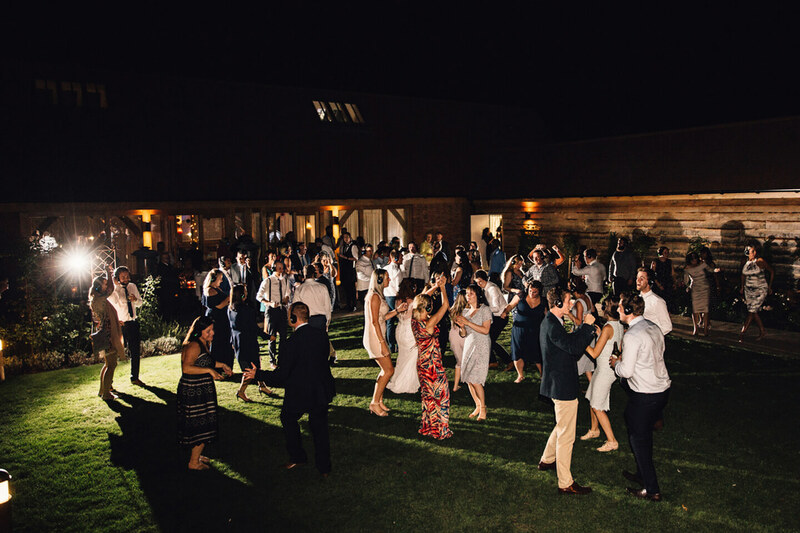 Pizza was served, although the newlyweds were so busy dancing, they missed it! ‘The staff at Bassmead kindly left an entire pizza in our room and a mountain of cake,’ says Katie. 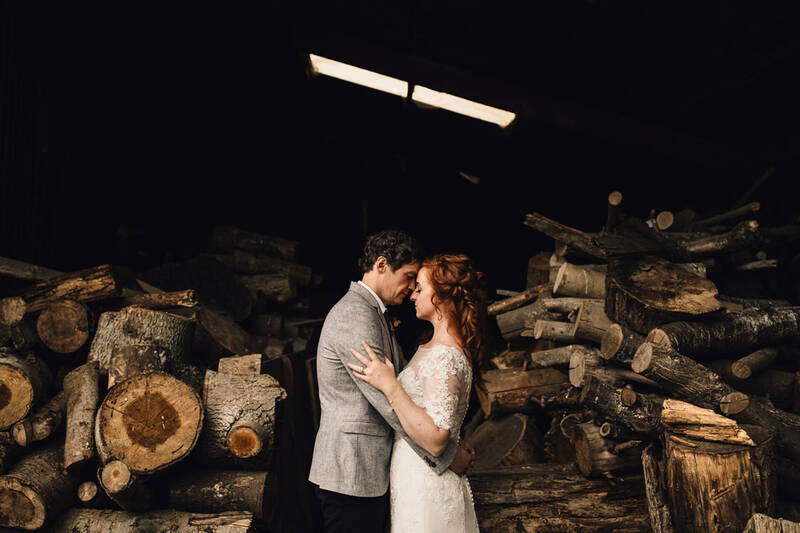 ‘We sat in our finery tucking in to pepperoni pizza and cake and talking about our amazing day. 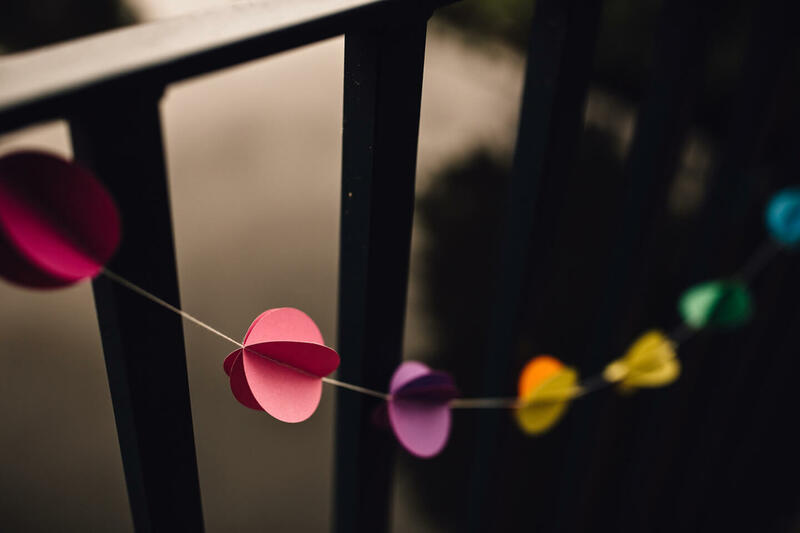 It was perfect’.